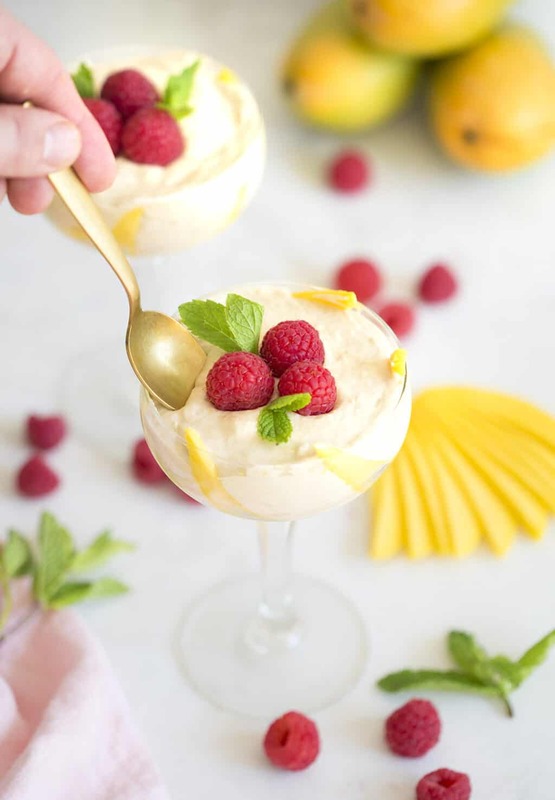 It’s getting hot an no one likes the oven on in the heat so let’s make a no-bake mango mousse with some serious tropical vibes! If you ever want to make a super fast mousse that just so happens to be vegan; use chilled coconut milk as the base. The can will separate into the liquid, which is great in smoothies, and the cream, which whips up into a great mousse or vegan whipped cream substitute. I actually made a similar version of this with my friend Lily from Kale and Caramel using raspberries and it was fab! My mom came over with a ripe mango, some coconut cream and a lot of excitement exclaiming the virtues of this super-simple recipe that I HAD to try out. Just four ingredients and no baking make for a very quick and easy treat and it all just so happens to be vegan! I will note that you should make sure to use a vegan sugar. This really just blended up, chilled and is ready! My mom actually only had three ingredients in her version but I did some recipe testing/modifications after she left (don’t tell her!) I sweetened it up a bit and added a drop of vanilla. If you’ve tried this mousse then don’t forget to rate the recipe and let me know how you got on in the comments below, I love hearing from you! I gussied up the presentation with some mango slices, raspberries and mint sprigs. 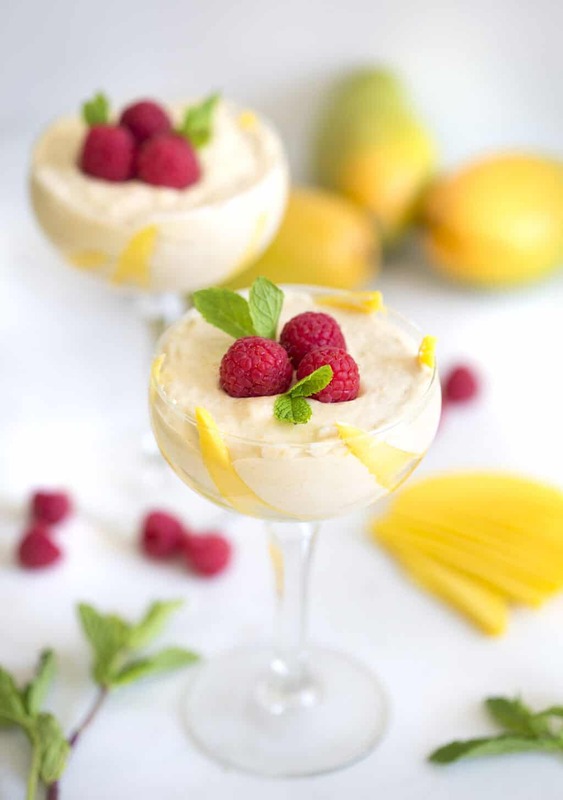 Really easy but definitely elevates the look since coconut cream will usually have some little flakes of cream that don’t mix in and the mango doesn’t color the mousse into a vivid yellow. Use a spoon to remove the pulp. Transfer to a strainer and push the pulp through. Blend the pulp until very smooth. Add maple syrup or your choice of sweetener and blend for a few seconds. In a standing mixer fitted with a whisk attachment, add coconut cream, sifted confectioners sugar and vanilla. Give it a whisk on low. Slowly increase speed. Scrape down the sides when necessary. While mixing, add about 1 cup of the mango mixture. Mix for about 5 minutes or until smooth. Pour into cups and garnish with a few raspberries. Chill for about 1 hour or overnight. 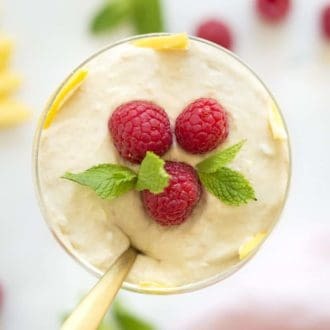 A light and delicious vegan mango mousse,perfect for a warm day. Slice a mango and use a spoon to remove the pulp. Transfer to a strainer and push the pulp through. In a standing mixer fitted with a whisk attachment, add coconut cream (so make sure to separate the water in the can and just use the cream. ), sifted confectioners sugar, maple syrup and vanilla. Give it a whisk on low. Slowly increase speed. Scrape down the sides when necessary. I gussied up the presentation with some mango slices, raspberries and mint sprigs. 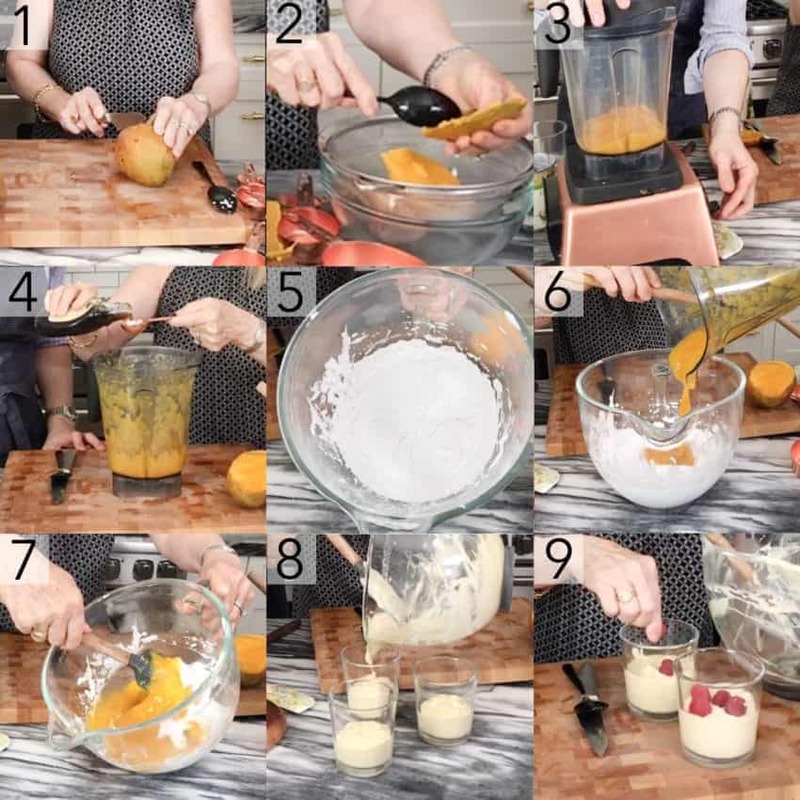 Really easy but definitely elevates the look since coconut cream will usually have some little flakes of cream that don't mix in and the mango doesn't color the mousse into a vivid yellow. I am so happy I stumbled across you on instagram. I love your stuff and I wanted to help you clarify something. 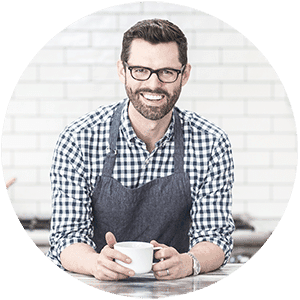 Your descriptionin the cover letter, says this uses coconut milk but the recipe calls for coconut cream. Two very different things, not only in flavor and texture but fat and calorie count. Can you clarify which one you actually used and the brand. Thanks again , I love your stuff. I don’t remember which brand of coconut cream I used in this recipe but I do know it was organic and I refrigerated it before! Hope you enjoy the recipe! This is a fun and healthy recipe! So simple! Thanks for sharing! Thanks for the inspiration! Maybe I will! I’m a little confused. To what texture are we looking for when whipping the coco cream mixture? (I.E., for how long to mix?) After whipping the coco cream, etc., you ONLY add 6 TSP. of the mango puree? I whipped until the texture was creamy and smooth! It’s up to you with how much mango to use! When I made this with my mom, we used about 6 tsp and only maple syrup for the sweetener. I made it again with confectioners sugar and 1 cup of mango and enjoyed the sweeter version more! Hope that helps!